How can I safely treat Cradle Cap in my infant? Cradle cap can be stubborn and you may need to treat it more than once to completely remove it. Here are instructions on how to safely and naturally treat cradle cap. Step 2: Use Coconut Baby moisturizer and gently massage into scaly spots. Step 4: Use baby brush or comb to gently massage the scales and comb out. Rinse out comb or brush if too many scales get in it and REPEAT this step. Step 5: Rinse head and hair thoroughly. Step 6 (optional): Use baby gentle shampoo to clean out oil from hair. 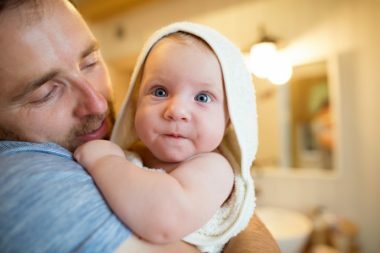 If your baby has a lot of hair, you could leave it in as a natural conditioner. If your baby has fine, thin hair, the oil might leave it looking greasy and you will want to wash it out. Repeat this process as many times as needed to completely remove cradle cap. **Coconut Baby contains no preservatives, chemicals, dyes, perfumes, parabens or sulfates. Previous Previous post: Got Cradle Cap? Next Next post: Cradle Cap is Pretty Crappy!